Media is a stand alone 2’, 3’, or 4’ square or rectangular pendant fixture. Each fixture requires its own power feed. Aluminum extrusion, with a matte anodized finish, mitred corners. Diffuser is extruded, frosted white acrylic, mitred corners. Suspended with field-adjustable aircraft cable, with pushbutton glider. 8’ gray 18 AWG power cord. Standard driver, constant voltage, 100W/24V, 120/277V, 50/60 Hz Class 2, in a remote housing. Back plate has a 7 /8” opening for direct conduit feed and is not intended for J-box mount. Delray’s Lux fixtures are second generation LED luminaires that provide conventional lumen levels at less than or equal to 1.4W/FT2. Lux features Nichia Corp. NFSL757 linear board chips, 6W per foot. White color temperatures include W30 (3000K), W35 (3500K), and W40 (4000K); matching the traditional CCT of existing incandescent, fluorescent, and metal halide lamps. Lux provides the best lumen/watt ratio per fixture, as well as precise color temperature matching for multiple fixtures. Standard options include dimming, for scene control and energy management. 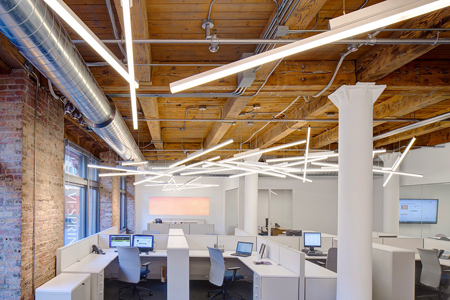 Delray’s Deco fixtures are cost-effective color LED luminaires, available in a variety of geometric configurations. Deco fixtures feature flexible 5050 universal voltage LED tape light; the most popular type of commercial LED light source available and, therefore, easily obtained and replaced. 24V for SQ–RGB; 12V for single color LEDs (Red and Blue). Deco standard LED color options include red and blue, as well as RGB sequencing, controlled with a DMX 512 interface (see BDMXMOD, below). Optional wall box control offered separately (see Traxon, below). Osram part no. OTDMXRGB supplied. DMX control interface for RGB LED. Provides DMX control with protocols that meet USITT DMX-512A or DMX512 (DIN 56930-2). No converter is required. DMX controls by others. A second 4-conductor control cable to fixture canopy is supplied.